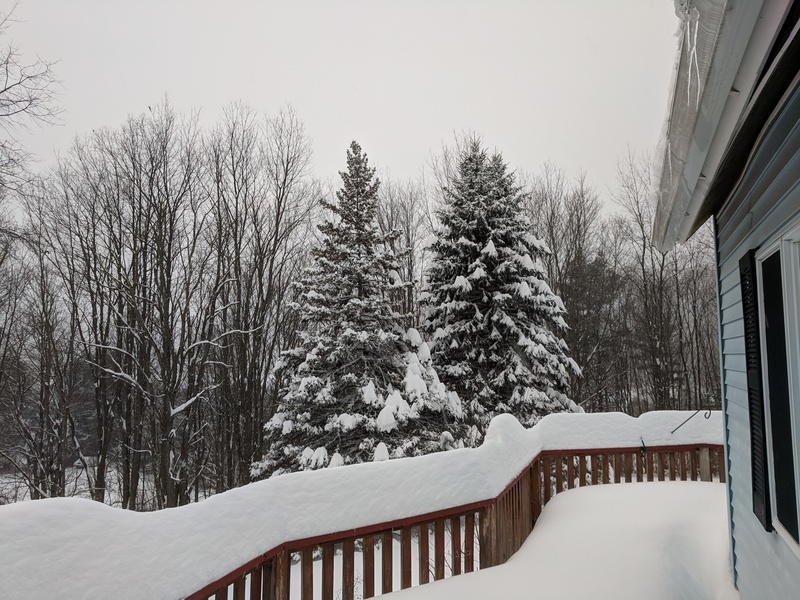 So there was a big snowstorm overnight, with 18″ or more of snow falling here in Richmond, VT. Okay, it wasn’t really a “snowpocalypse” in the sense of power going out and roads being impassable … mainly because it just never got windy. A quick check of the Green Mountain Power outage map just now showed everything A-ok.
To get real frustration, you need wind blowing drifts right back over roads that just got plowed, and wind bringing snow-laden branches down on power lines. What makes this latest storm stand out is that it’s below zero Fahrenheit, and anyone who lives in a snowy part of the continent knows that you don’t typically get big snow when it’s that cold. I suppose it must have been warmer higher up in the atmosphere. It was cold enough out that we skipped the Women’s March in Montpelier on Saturday morning even though a friend of Carole’s was one of the scheduled speakers and we’d wanted to go hear and support her. Neither of us felt brave enough to go stand for a couple of hours in zero degree Fahrenheit weather and have to rely on porta-potties if and when the urge arose. I have visions of being frozen into one of those things, and I want nothing to do with that. The approach of this storm scared people enough that businesses were posting “we’re closed until Monday” notices on Facebook on Friday night. Ditto for churches — we knew as of Friday afternoon that there wouldn’t be services today. That’s actually kind of rare. Mostly Vermonters just keep on going until the power goes out. But five degrees below zero AND snow falling at a rate of an inch or two an hour for twelve straight hours is enough to deserve at least a bit of notice. We went around last night and double-checked all the windows and pulled down all the blinds. It was damn cold out and we wanted the warm to stay on the inside. I went out yesterday afternoon before the snow really got going and raked the accumulated ten inches or so of existing snow off the roof of our new gazebo, then did a second pass today. 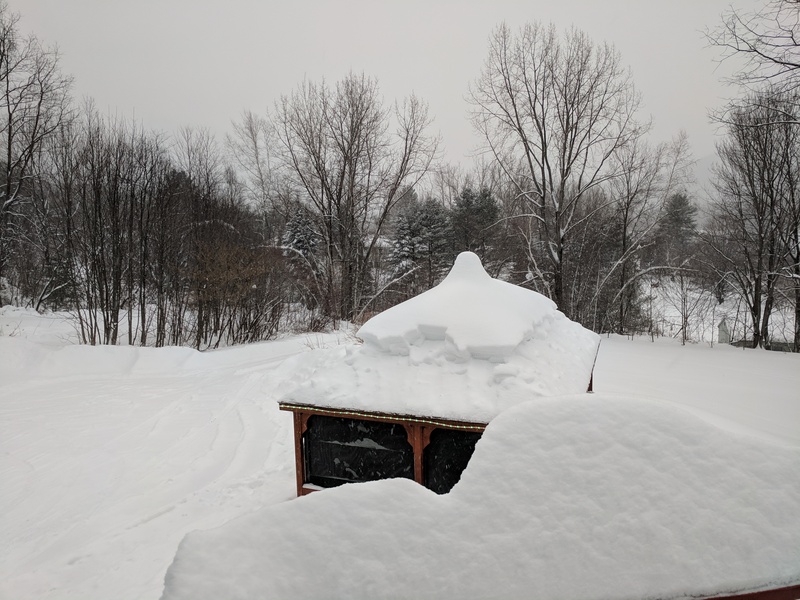 Truth is, I have no idea how strong our new gazebo’s roof is, but I don’t want to find out the hard way that two feet of accumulated snow is beyond its design load. Looks like it’s time to break down and go buy a proper snow rake with a long extensible handle. As of 3 pm or so, the snow’s basically stopped and the main roads are all plowed and passable. The supermarket in Waterbury was open, though most small businesses were closed. We drove up to the Bolton Valley ski area, a couple of miles from our house, and the lifts were open and the parking lots were full. Good snow means good business! Unfortunately, they’d also had a water line breakage and at least one of their restaurants was closed. I’m sure they’ll cope. Long story short, our house is now in full Santa’s-Workshop mode. Cue the yetis, it’s time for a party.